Fig. 1—Drive shafts, cams and slide arrangement for a simple four-slide machine. Most of the topics addressed in this column during the past 13 years cover metal stamping processes and dies. However, metal forming includes more than just stamping. In coming months, this column will examine other metal forming processes, and associated tooling challenges will be addressed. This month, let’s look at slide forming. Ideal for high-volume production of intricate springs, spring clamps, retention clips, intricate stampings and wire forms, slide forming machines, often referred to as four-slide machines, come in several variations and configurations. These include four-slide and multislide machines produced in either horizontal or vertical orientations, radial-forming machines and linear-forming machines. The basic slide forming machine, known as a four-slide, consists of a feeding device, four fixed-position forming slides, and a forming mandrel (center tool) suspended by a bridge support straddling the back tool-slide. 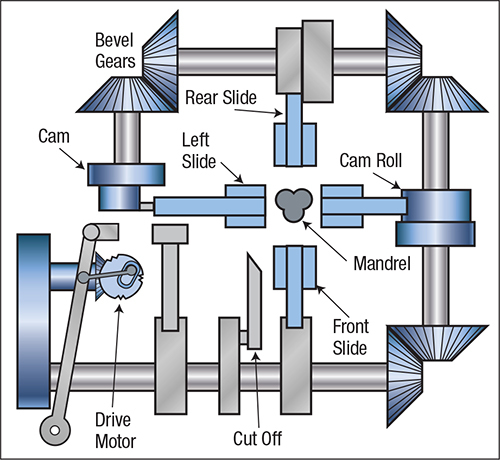 The slides are driven by four shafts positioned around the outside of the machine, with the shafts connecting at the corners with bevel gears. This arrangement allows one shaft to be driven by an electric motor. That shaft's motion drives the other three shafts (Fig. 1). Each shaft has cams that drive the slides. Tools, attached to the slides, form the part by cutting wire or strip stock and then pressing it around a mandrel. The shapes of the tools and the mandrel dictate the shape of the final part (Fig. 2). Fig. 2—Slide forming tools closed around part (left), and with tools open for part ejection (right). Multislide machines have up to eight fixed-position slides, permitting extra forming motions. Typically, multi-slide machines, built stronger than conventional four-slides, accommodate thicker and wider materials. Both machine types may be equipped with an optional press station to accommodate a small die for notching and punching. A vertical slide forming machine arranges slides and tooling in a vertical position. Here the press operates vertically (up and down) and the forming slides move in a vertical plane against a center form projecting from the machine bed. Not limited by fixed slide positions like their four-slide and multislide cousins, rotary slide machines are another type of vertical-forming machine. As many as 10 adjustable slides, positioned radially around the workpiece work together to form simple as well as more complex part shapes. Mechanical cams, programmable servomotors or both (hybrid) may actuate the slides. Linear-forming machines are vertical machines with the ability to place several opposing slides, arranged in a linear fashion, on both the front and backsides of the tooling area, providing the ability to produce very complex stampings and assemblies. The first slide forming machines were four-slides, built in Connecticut during the late 1800s. By the turn of the century, there were three major manufacturers of four-slide machines within 40 miles of each other. The Baird Co. opened for business in 1846, producing four-slide wire forming machines in Huntington, CT and eventually moving to Stratford, CT, in 1912. In the 1960s, it merged with U.S. Tool Corp. to become U.S. Baird Corp. The A.H. Nilson Machine Co. opened for business in Shelton, CT, in 1904, developing a complete line of wire-forming machines throughout the early 1900s. In the 1930s, Nilson added a horizontal press to its four-slide machine, expanding its offerings into strip forming. In 1986, U.S. Baird purchased A.H. Nilson Machine Co., making Baird the largest producer of slide forming equipment in the United States at that time. The Torin Corp., Torrington, CT, also entered the four-slide field in the early 1900s. In 1957, a complete line of vertical-forming machines was developed and marketed under the trade name Verti-slide. The 1980s were difficult for the company, which changed ownership a couple of times, eventually closing in 1990. In 2007, Hayden Manufacturing, Thomaston, CT, acquired certain assets, intellectual property and the rights to manufacture various product lines of U.S. Baird, including replacement parts for U.S. Baird and Nilson four-slide machines. Slide forming processes, similar to stamping processes, use production lines consisting of payoff equipment for wire or coiled strip, loop-control device, stock straightener and feed system. The feed system feeds wire directly to the cutoff and slide forming stations. Coil strip also may be fed into one or more in-line die stations or into a small progressive die for notching, piercing and/or coining before reaching the cutoff and forming stations. Slide forming dies experience the same problems associated with progressive dies, related to feed-line height, stock alignment, feed timing, stock positioning, slug retention, scrap ejection, off-center loading and stock buckling. Unlike progressive stamping dies, slide forming machines are capable of complex forming motions in four or more directions. In contrast, progressive dies move up and down only. Complex forming motions require expensive cams, adding cost and complexity to the die. Next month: Tooling applications for four-slide and multislide machines. Thanks for the history. I worked on a Baird 100 ton four slide that my company purchased used in the mid 1960's. At one point in time during the late 1980's the casting was cracked due to a severe tooling crash. Baird still had the drawings of that model which was apparently built sometime in the 1940's. We had a completely new machine built and it's still in service to this day.